A hurricane watch has been issued for Hawaii and Maui counties in Hawaii. Hurricane Lane is expected to turn towards the islands later this week. 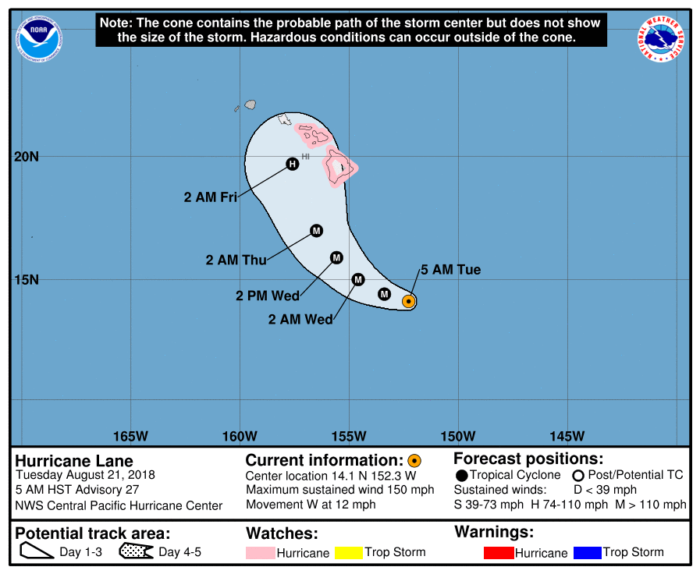 Currently, Lane is a category 4 hurricane with winds up to 150 mph. Slight weakening is anticipated as the hurricane moves closer to Hawaii, however, hurricane conditions will be possible as early as Thursday. The main concerns will be damaging winds and excessive rainfall. Flash flooding and landslides will be possible as total rainfall is expected to reach 10-15 inches with some isolated 20 inch amounts.